Riding a bicycle around the Americas for two years; Writing a book; Renovating an abandoned watermill in Burgundy... I am sure non of these 'projects' were on my high school career advisor's note bad when I was being evaluated for my future, but life can be an unpredictable affair. Selling wine was also an unlikely entry, but it can now be added to the list. Like all good wines The Thirsty Cyclist began with a barrel. In 2016 we were searching for a good, easy-drinking wine to serve to our guests at The Hungry Cyclist Lodge. So collaborating with good friends and local winemakers Chris & Lucie we made our first barrel of Beaujolais Lantignie. 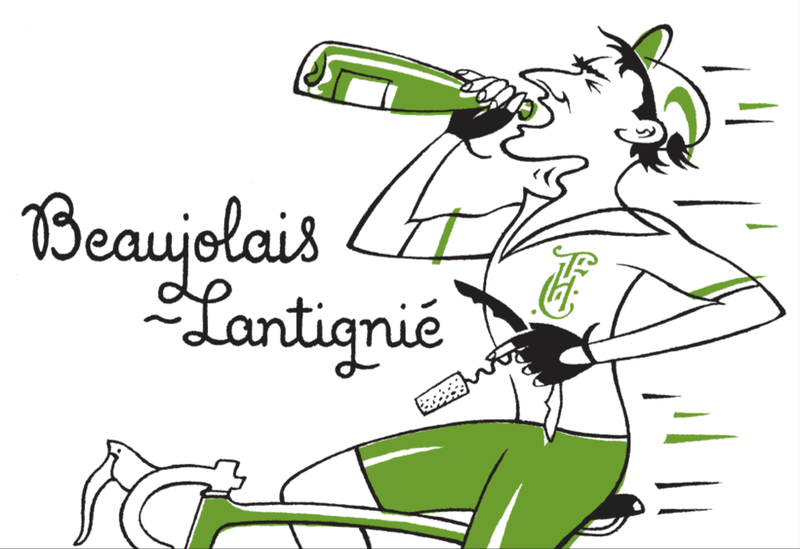 This juicy Beaujolais, from organic vineyards in the village of Lantignie, was soon lapped up by Thirsty Cyclists returning from a day on the road, and due to its success, and with supply soon exhausted, in 2016 we decided to expand the project and introduce The Thirsty Cyclist to wine enthusiasts beyond the bounds of The Hungry Cyclist Lodge. We continued withe the popular Gamay as well as adding a rare chardonnay from the Beaujolais, refreshing and full of floral notes and zest. A totally enjoyable Beaujolais Village. Strawberries on the nose are followed by deeper aromas of spice & jammy red fruit. Perfect for washing down a plate of charcuterie, shared with a grilled bavette or as a last bottle before bed. A neat white wine with pleasing initial aromas of honeysuckle and blossom. Apples and ripe pears follow-on and the granite terroir of this rare Beaujolais Chardonnay give the wine a refreshing mineral structure. Enjoy as an apero; with a dozen oysters or alongside a grilled goats-cheese salad.